The memorial is constructed of Portland stone. A two-tier base, square in plan with clipped corners supports a two-tiered chamfered square cross section plinth from which rises a pillar of slightly narrower cross section. The east face of the upper tier of the plinth bears a somewhat weather-worn raised carved emblem. By 1917 a War Memorial Committee chaired by Mr. James Thomas had been formed as an adjunct to the organisation styling itself ‘Porthcawl Pals Pleasant Saturday Afternoon Club’, whose main purpose had been to entertain convalescent soldiers at the local hospital. A fund was opened to raise money by public subscription for the erection of a suitable memorial to cost in the region of £300. It was suggested that it comprise a rough Cornish or Aberdeen granite base with a figure upon it with room on the base to carve names of the fallen. Mr. Robert J. Newberry was commissioned to prepare a design,3 which seems a strange choice since he was most noted for designing stained glass windows. 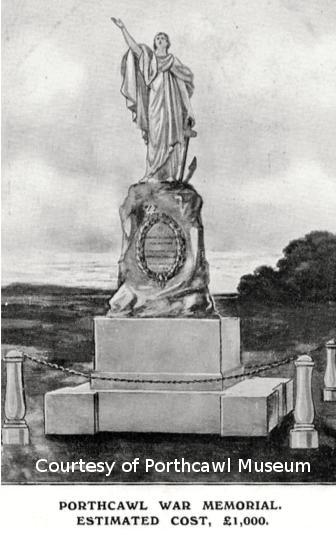 At this stage it was apparently envisaged that the memorial would take the form of ‘a beautiful statue in a prominent place on or near the front’; Figure 3. At a meeting in April 1919 Mr. James was asked to meet with bereaved parents to ascertain their feelings on what form the memorial should take. Newberry’s statue was apparently to be of marble, but in a letter from Mr. Thomas to Mr. Newberry dated 9th July 1919 the Committee stated it was to be of bronze and asked him to put forward the names of three sculptors capable of executing the work. 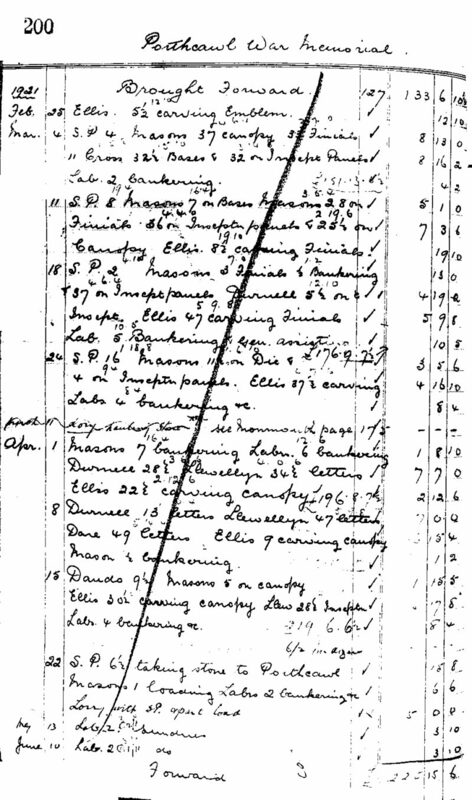 In the meantime by 1918 the estimated cost had apparently escalated to £900 – £1,0004. However, only about £400 pounds was initially raised, which was augmented by a further donation of £100 from Mr. Charles Morris, father of Major Charles Alan Smith Morris, Bedfordshire Regiment who had been killed in May 19175. 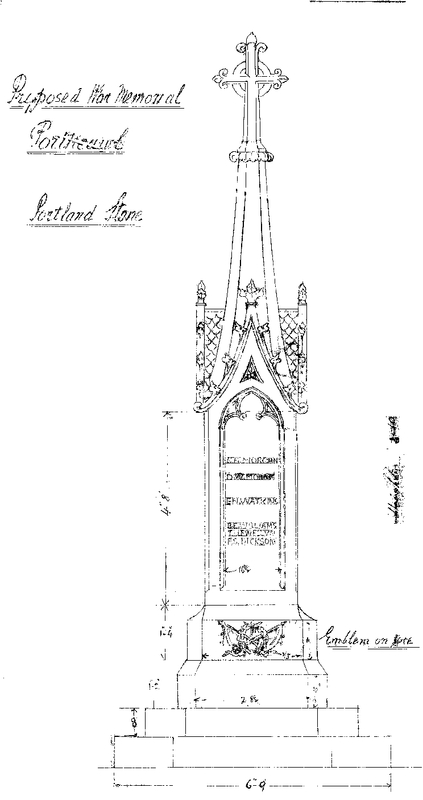 A design by W. Clarke for an estimated cost of £420 was eventually adopted and the sheltered location of All Saint’s churchyard was agreed rather than an exposed location near the sea front. The idea that the memorial might include a German gun was severely criticised and came to nothing6. 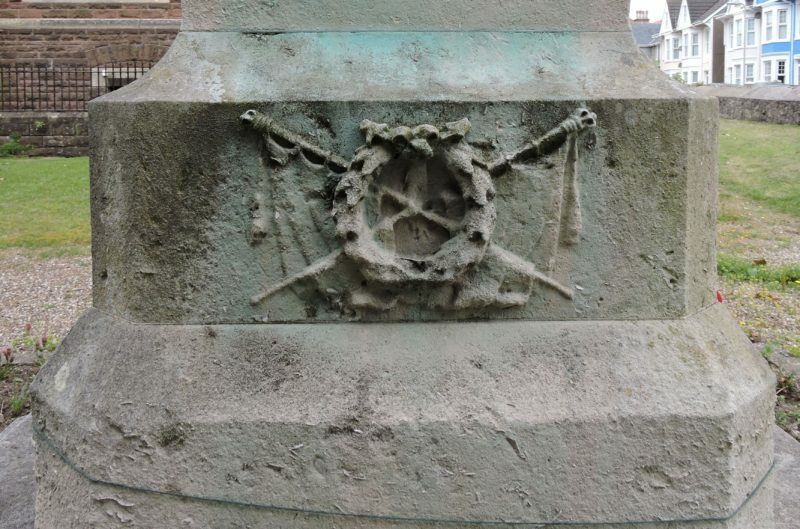 The design is very similar to that of Miskin war memorial but without the figures. Work commenced on 6th August 1920 with Mr. Harry Gregory, originally from Cowes and by now 70 years of age, making drawings; Figure 4, and Thomas Guy Clarke, William Clarke’s son making three journeys to Porthcawl, presumably to discuss details. At this stage of the proceedings it would appear that the committee was still envisaging that the memorial should incorporate figures as there is a line in the Day Book crossed out which reads “Greg 3 [hrs] making full size drawing of figures”. Between October 1st and November 12th a little further work was done on design and Henry Durnell, William Clarke’s nephew and a native of St. Georges-super-Ely, Glamorganshire worked on the lettering. However, the job only really got into full swing by the middle of January 1921, presumably having being held up by discussions on the design and costs. 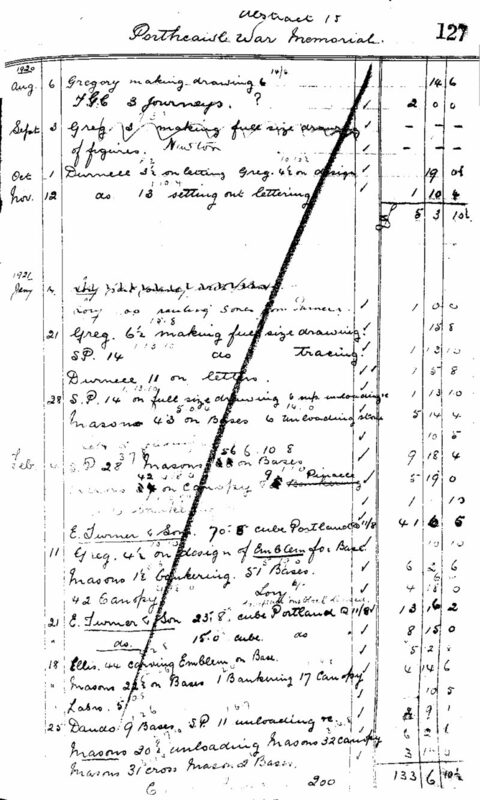 During January more work was done on design and presumably agreement was reached as the first delivery of 70 cubic feet of Portland stone from E. Turner and Sons arrived in Clarke’s yard in Cardiff in early February, followed by a further delivery of 40.8 cubic feet during the following week. A Mr. Ellis is on record as having carved the emblem, a full size drawing of which survives in the archive; Figure 5, with Mr. Durnell mostly responsible for the lettering. In all, excluding Guy Clarke’s input and haulage, a total of seven named individuals and other unnamed masons and labourers worked a total of about 1,817 man hours to complete the memorial. 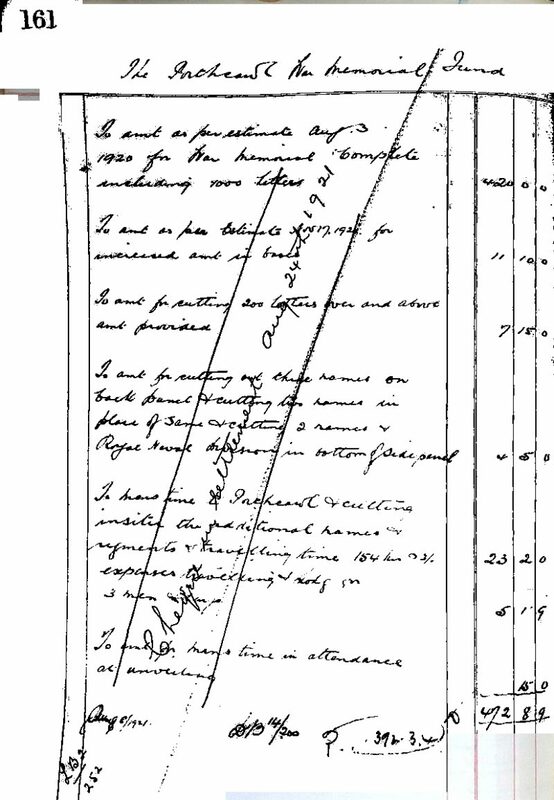 Rates of pay were 1/10 for labourers and 2/2 for masons. Total day work, materials and incidental expenses came to £392:3:4. Including extra work over an above that in the original estimate the final bill came to £472:8:9, representing a profit of about 20%. 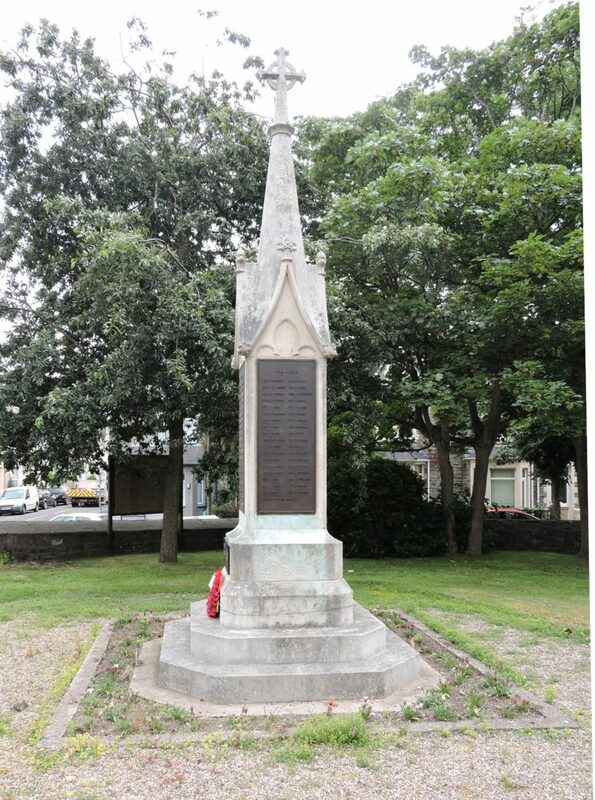 The memorial was unveiled on 16 July 1921 by Colonel H. R. Homfray of Penlline Castle, Cowbridge and was dedicated by the Bishop of Llandaff, Joshua Pritchard Hughes. Shortly after the unveiling ceremony Mr. Sidney Llewellyn7 from Clarke’s spent nine and a half hours cutting additional names at a further cost of £3:2:6 and in May 1922 £3:16:0 was charged for ‘time and expenses cutting lines between letters’. In November 1926 the memorial was cleaned and the name of Lieut. Col. Frank Gaskell, Welsh Regiment was added. The monument was cleaned and the plaque bearing WW2 names was added in 2011. 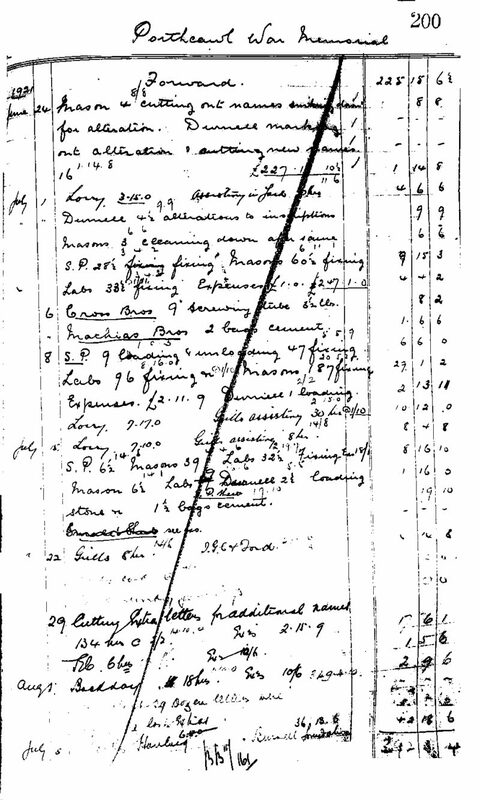 Bill Book and Day Book records are appended; Figures 6 – 14. 3 Glamorgan Archives, D/D XKB/1. Porthcawl War memorial committee letter book of James Thomas. 4 The Porthcawl News, 13 October 1918. Porthcawl’s War Memorial. 5 Ceri Joseph. Personal communication. 7 A newspaper article with a photograph taken in Clarke’s workshop featuring Sidney Llewellyn dated c1946 has been found in Clarke’s archive, though the source newspaper has not yet been found. Born c1892 he served in the Royal Engineers in WW1 and was badly wounded. He was a past student at the Cardiff School of Art.